When heading to Zambia for a visit, my company ResRequest helped me shop for supplies so that I didn’t go empty handed. I Packed for Purpose since I was visiting Remote Africa Safaris camps and took supplies to Mkasanga School, one of the projects they support. 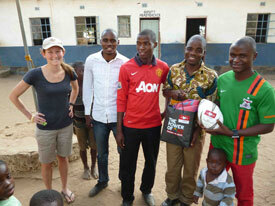 The supplies included balls, skipping ropes, stickers and calculators. It was our pleasure to Pack for a Purpose and support our client, Remote Africa Safaris’ efforts in making a difference for young learners in remote areas.